Great hotel as well as restaurant in the hotel. Staff was fantastic. The rooms are amazing and big. The balcony is huge and a good place to relax and have beer. The bathroom is big as well and the toiletries given are top quality. Location is fantastic as well. Super hotel, spotlessly clean, friendly staff, great breakfast and fab location. We only stayed one night but couldn’t fault the place. The breakfast was lovely, pool side was good, great location, very clean, nice staff. Lovely decorations for Halloween. Excellent location, near the beach, the port, the restaurants and the shops. A short walk to the town of Alcudia. Rooms were very clean, towels etc. changed regularly. They came round with a small bottle of sparking wine which was a nice touch and rang up after first night to check everything was ok. We didn't eat at the hotel so can't comment on food. Location was great for beach and amenities and buses etc. Good location, nice looking property and spacious rooms. Very reasonable price. The beach was very close and there are many stores and restaurants nearby. It's also close to the port, and in the evenings the location is very lively, but not too loud. Lock in a great price for Alcudia Garden Aparthotel – rated 8.4 by recent guests! 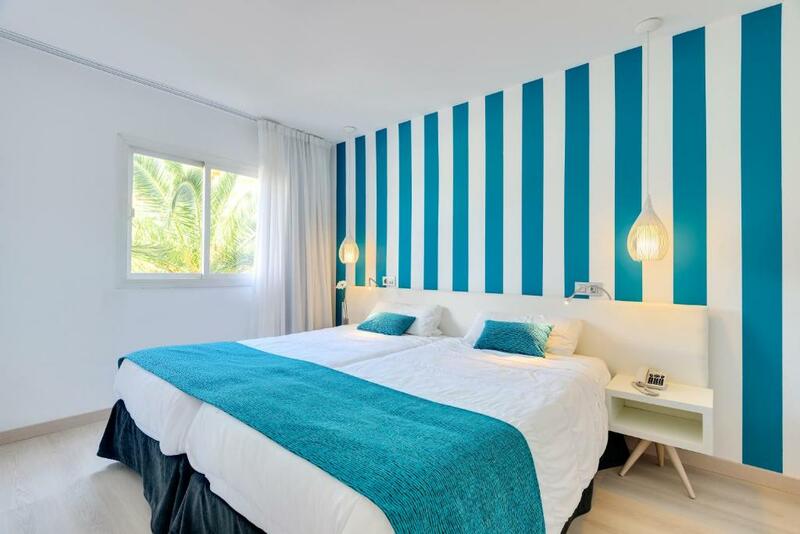 Alcudia Garden Aparthotel This rating is a reflection of how the property compares to the industry standard when it comes to price, facilities and services available. It's based on a self-evaluation by the property. Use this rating to help choose your stay! Located 250 feet from the magnificent, spacious and sandy Alcudia Bay Beach, the hotel offers an ideal location for a relaxing holiday, with 2 swimming pools and 26247 ft² of beautiful gardens. 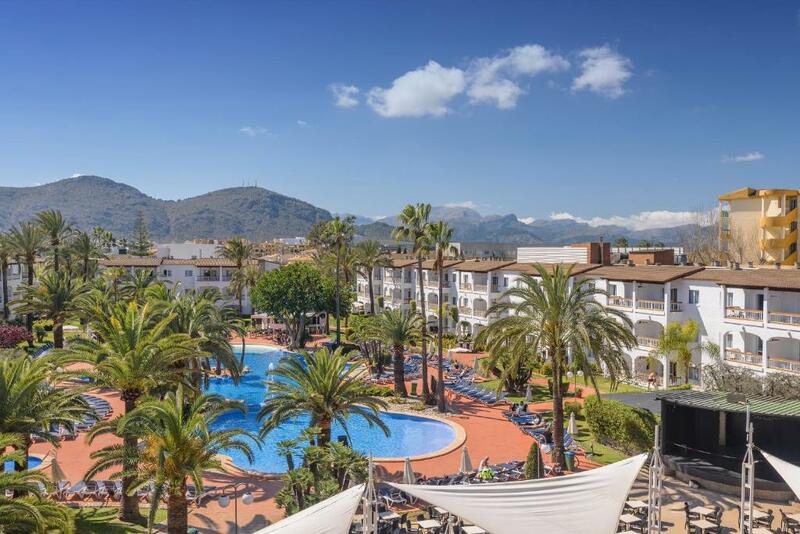 Enjoy a fun-filled break for all the family at the Alcudia Garden Aparthotel, whose spacious, air-conditioned accommodations has a balcony where you can soak up the sun. Free Wi-Fi is available throughout the property. 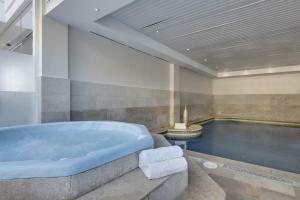 Relax in the sauna and hot tub, or spend the time swimming in the sea or the hotel’s pools. Choose from activities including free-of-charge sports such as archery, table tennis and aerobics, or visit the Alcudia Garden’s fitness center. At night, enjoy performances and shows, including live music in the summer. There is a bar by the pool and a pizzeria. Children can have fun at the playground, in the children’s pool, and with the entertainment program led by the hotel’s monitors. There is also a mini-club for kids aged 4-12. The Aparthotel Alcudia Garden is also set close to s’Albufera, the top Natural Park in the Balearic Islands. You can explore the natural surroundings with a bike rented at the hotel, or head to the cosmopolitan Puerto del Alcudia for a range of activities. 뀐 Located in the top-rated area in Port d'Alcudia, this property has an excellent location score of 8.8! When would you like to stay at Alcudia Garden Aparthotel? This air-conditioned room offers a balcony, flat-screen satellite TV and a private bathroom. A safe is available to rent. Free Wi-Fi is also available. The maximum occupancy for this room is 2 adults. This air-conditioned apartment offers a balcony, 1 bedroom, a private bathroom and a living room with 2 sofa beds and flat-screen satellite TV. The kitchenette includes a fridge and microwave. A safe is available to rent. Free Wi-Fi is also available. 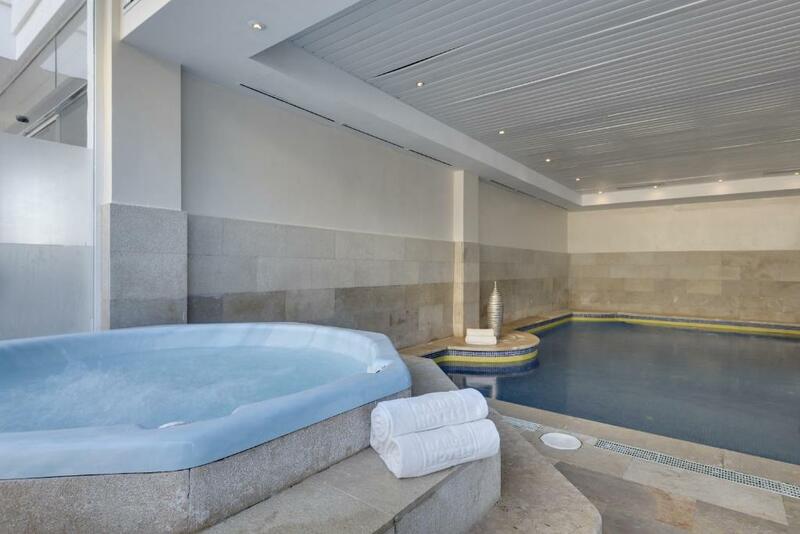 This air-conditioned room has a balcony, flat-screen satellite TV and a private bathroom. A safe can be rented. Free Wi-Fi is also available. El Alcudia Garden Aparthotel es un complejo hotelero de 3 estrellas situado a 80 metros de la playa de Alcúdia, en la costa norte de Mallorca. El establecimiento, parcialmente renovado en 2015, ofrece acogedoras instalaciones y una amplia variedad de servicios y actividades que permiten disfrutar de unas confortables vacaciones en familia. El Alcudia Garden Aparthotel dispone de amplios y luminosos apartamentos y habitaciones completamente equipadas. Más de 8.000 m2 de jardines y amplias terrazas rodean la piscina exterior, el parque infantil, el bar y el restaurante buffet del hotel. En su interior el hotel alberga un área con piscina climatizada y gimnasio. 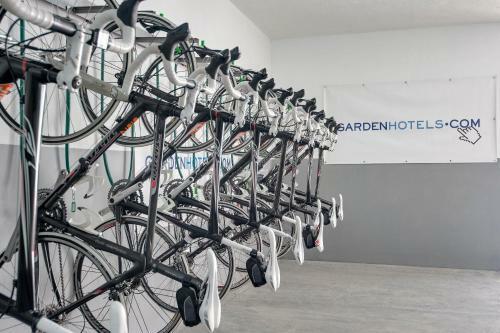 Además, el hotel dispone de garaje para bicicletas con taller de reparación y zona de lavado. 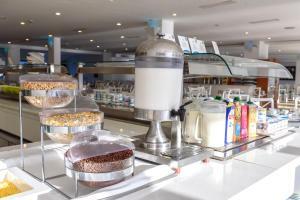 En el restaurante, un variado buffet de calidad ofrece menús temáticos e infantiles, degustación de productos locales, dietas para deportistas y alimentos sin gluten aptos para celíacos. Por ubicación, entorno y una excelente relación calidad-precio, el Aparthotel Alcudia Garden es una magnífica elección para disfrutar unas completas vacaciones en familia. Garden Hotels es una cadena hotelera mallorquina con una vasta experiencia en el sector de la hostelería. Nuestros valores representan nuestra identidad como colectivo y todo el equipo que forma Garden Hotels nos esforzamos día a día por cumplirlos: hospitalidad, compromiso, confianza, ilusión, sostenibilidad e innovación. Somos diferentes porque las personas que hacemos esta empresa creemos en un proyecto único y diferenciador. Generamos confianza a través de nuestros clientes y también a nuestros trabajadores a través de la sinceridad, la honestidad y la transparencia. A través de estos valores conseguimos una estabilidad, fiabilidad y seguridad que hace de Garden Hotels tu hotelera de confianza. El Alcudia Garden Aparthotel se ubica a 80 metros de la extensa playa de Alcúdia, en el norte de Mallorca. Alcúdia y sus alrededores brindan la posibilidad de disfrutar de numerosas actividades al aire libre cerca del mar. El Aparthotel Alcudia Garden está situado junto a uno de los humedales más importantes de la isla: el Parque Natural de S’Albufera. Este espacio protegido, de alto valor medioambiental, alberga en su interior una amplia variedad de especies animales y vegetales autóctonas. Sin duda se trata de un auténtico paraíso para los amantes de la naturaleza. Del Port d’Alcúdia parten numerosas rutas señalizadas que discurren entre el mar y la montaña para recorrer en bicicleta, a caballo o a pie. La oferta de ocio se completa con un parque acuático y excursiones marítimas en barco que ofrecen la posibilidad de explorar las calas y acantilados de la costa norte de Mallorca. House Rules Alcudia Garden Aparthotel takes special requests – add in the next step! Alcudia Garden Aparthotel accepts these cards and reserves the right to temporarily hold an amount prior to arrival. Accommodations is cleaned every 5 days from June until January, and every 4 days from February until May. During the summer months drinks are included in halfboard rates. Until 16:00 - EUR 20. After 16:00 - EUR 35. Check out staff early morning. Parking space is limited and have to park in the street. They could equip the small kitchenette slightly better. And btw, Alcudia has little to offer. This place was perfect except for the mosquitos at night which made the stay disappointing. My son had 27 bites on one arm! Though choice of food was quite rich my children plates left unfinished always in contrast to another hotel we stayed in Mallorca right before.